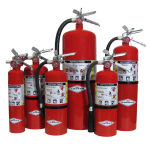 These fire extinguishers utilize a speciallly fluidized and siliconized mono ammonium phosphate dry chemical. It chemically insulates Class A fires by melting at approximately 350 degrees and coats the surface to which it is applied. It smothers Class B fires and is not electrically conductive. 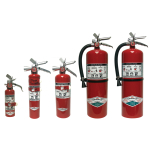 These units are a cost effective way to protect most common building hazards. 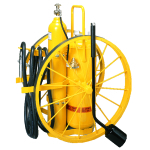 The perfect extinguisher for “clean” applications. Leaves no residue. Non-conductive “C” rated. A perfect replacement for Halon. Carbon Dioxide has a Zero ODP index and no CFC’s. 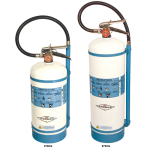 Both Regular and Purple K Dry Chemical portable fire extinguishers are available for the specialized flamable liquid hazard. These units are available in sizes 1lb. through 20 lb. 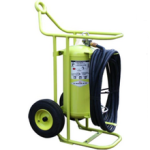 The water extinguisher utilizes the cooling, soaking and penetrating effect of a 45-55 ft. stream of H20 to very effectively put out Class A fires even for inexperienced operators. These units may be protected from freezing by using the loaded stream charge instead of plain water. 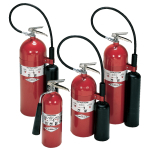 The two models of foam extinguishers are effective against both the Class A and Class B fires. They can also be used on flamable liquid spills to prevent ignition. Models #270 – 1 3/4 Gallon and #272 – 2 1/2 Gallon; Both are UL Rated 2A:C. Another innovative solution for “clean” area application needs. Environmentally Friendly: No O.D.P. (Ozone Depletion Potential) – No EPA phase out or restrictions – No global warming concerns – Non magnetic construction – Non toxic – No powder residue. Perfect for: Hospital Operating Rooms, Electrical Equipment, Telecommunication Equipment, Video and Sound Studios, Computers, and other sensitive equipment areas. 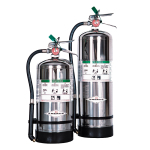 The 6 – Liter Wet Chemical portable fire extinguisher Model #B260 and the 2 1/2 Gallon Model B262; Specially designed for restaurant grease fire applications. 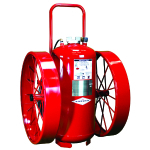 Meets the new NFPA-10 “K” Class requirement. New for “Clean” Applications, computer rooms, telecommunications facilities, clean rooms, data storage areas, electronics, cars, boats, and other sensitive areas. 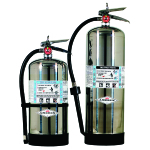 A perfect Halon 1211 fire extinguisher replacement. HALOTRON 1 is a user friendly “Clean Agent” HydroChloroFluoroCarbon discharged as a rapidly evaporating liquid which leaves no residue. It effectively extinguishers Calss A and B fires by cooling and smothering and it will not conduct electricity back to the operator. Halotron is EPA and FAA approved with a low GPW of 0.04 – 0.24, low ODP of 0.014 and a low Atmospheric Lifetime (3 1/2 to 11 years). 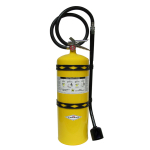 The extinguisher of choice when faced with burnable metals such as Sodium, Magnesium, Potassium, powdered Aluminum, Titanium, Lithium, and other Class D materials. 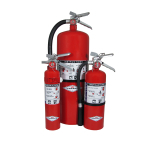 Models are available utilizing ABC, REG, or PK Dry Chemical, Foam, CO2, and Class D agents. They range in sizes from 50lb. to 300lb. Excellent for HIGH hazard situations.